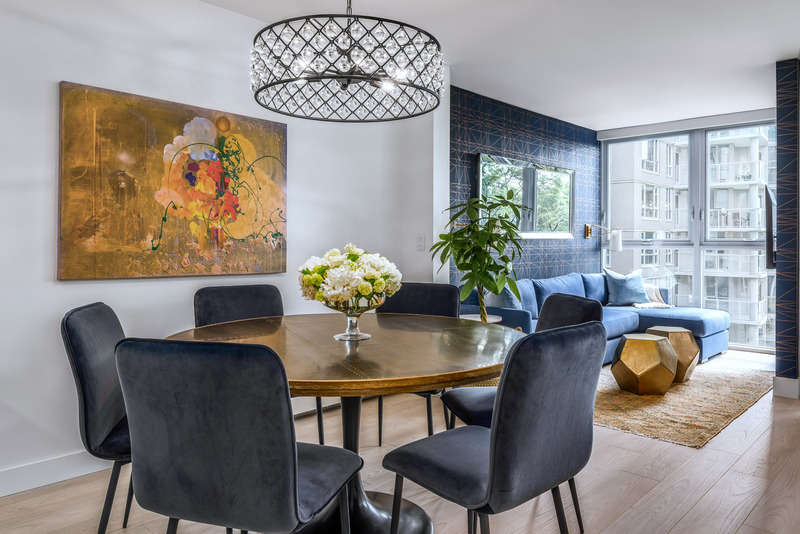 A glamorous pendant light and original artwork serve to delineate the dining area from the kitchen and the TV room. Light: LH Imports; furniture: Suquet; artwork: Sunny Days by Caro. SOMETIMES, DOWNSIZING IS AN EXERCISE in winnowing out extraneous possessions and fitting the remaining ones into a smaller home. 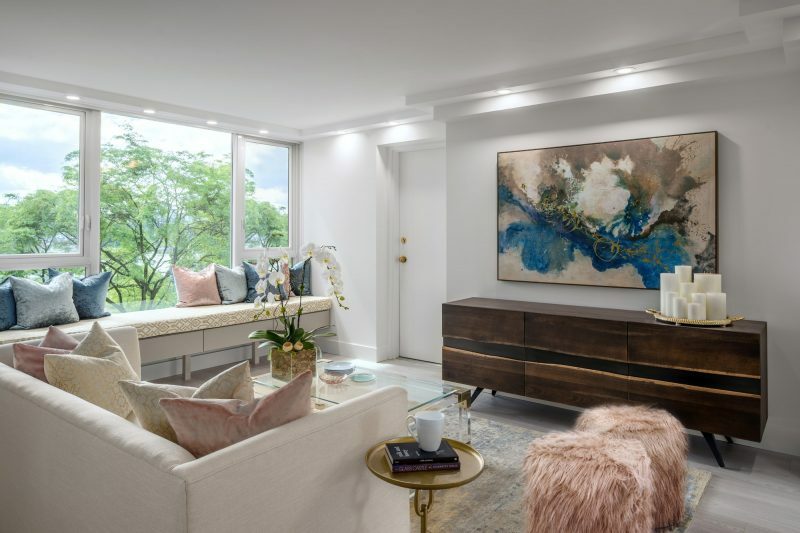 But sometimes it’s starting from scratch, as the owner of this condo apartment in Yaletown did. Dark wallpaper and furniture in the TV room were chosen to bestow a cozy feeling. Wallpaper: Hygge and West; side tables: West Elm; rug: Surya. Reihani was happy to oblige her client, who had looked at a portfolio of Space Harmony projects and picked out examples of what she liked, after which she dropped a little bombshell: she told Reihani to design the apartment “as if it were your own home,” and then she left the country. Having carte blanche “is the best type of project,” says Reihani. “It’s exciting, but I also get nervous. I want to do extra for someone who trusts me.” Excitement, fear, worry – all the emotions flitted through her mind as she began the project. It was clear from the outset that she would have to reinvent the space in the large-ish (1,100 square feet) but dated 20-year-old apartment. There were the entry, three bedrooms, two bathrooms, an apartment-scale “great” room of kitchen and living/dining area, and another living area at a right angle to the great room. Reihani and her team tweaked the layout to make it more functional, and also used design tricks to make the various public areas more delineated without creating a truncated look. Vicostone’s quartz in Dark Gray clads the niches in the bathroom. Of course, the designer confirmed all the basics with her client before renovation, redecoration and furnishing got under way. Reihani also kept her client up to date by email, reporting on what stage the project was at. The cabinetry is a light-grey oak veneer. 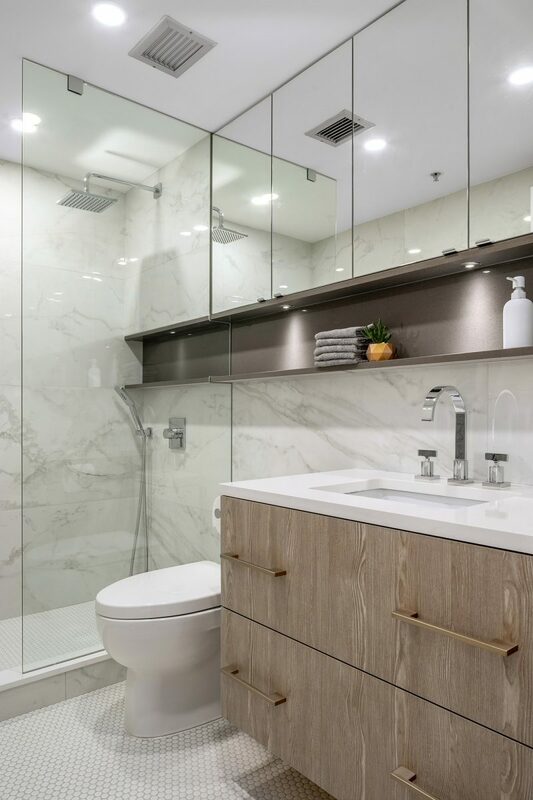 The wall in the main bathroom is Bianca Carrara marble from Creekside Tile; the penny rounds white glazed porcelain mosaic flooring is also from Creekside. The kitchen was the most radically changed. It had been rather claustrophobia-inducing, semi-enclosed and crammed with appliances and cabinetry. 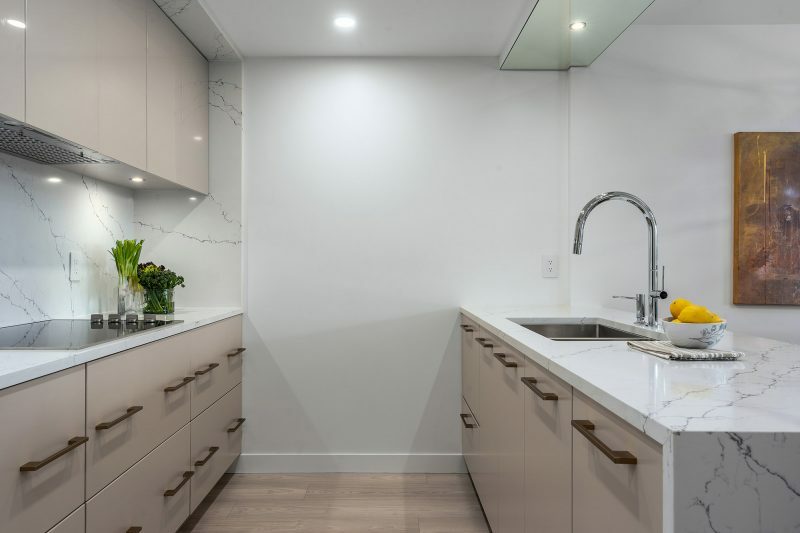 Reihani kept the coat closet near the front door but borrowed space from the hallway that led from the entry past the kitchen, having a run of streamlined floor-to-ceiling cabinetry fabricated by Modaa Custom Kitchens installed in what had been another closet along the outside wall. The cabinetry holds the wall oven, a full-size fridge/freezer, storage cupboards and drawers, and access to a storage room. This leaves the now-open kitchen space with more work surfaces, incorporating the cooktop and the sink. It was not possible to install lighting directly overhead in the living room, so designer Negar Reihani had lightboxes built to skirt the ceiling. The handsome live-edge wood credenza is from Moe’s, and the shaggy ottomans are from Homesense. 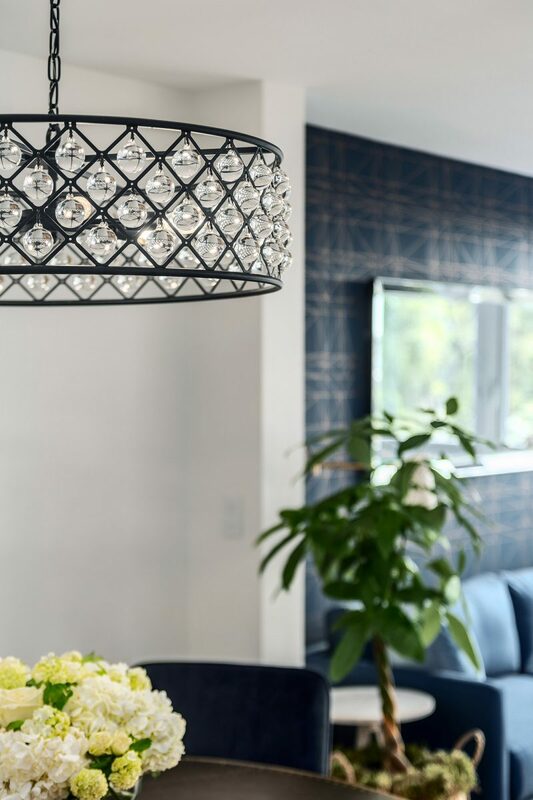 Next to the kitchen peninsula is the dining area, set apart by its glamorous pendant light over the table. Beyond it is the TV room, particularly striking in dramatic dark blue wallpaper with a gold geometric pattern. A welcoming sofa with a chaise longue extension is a slightly paler blue, and the room has a deluxe, muted mood. 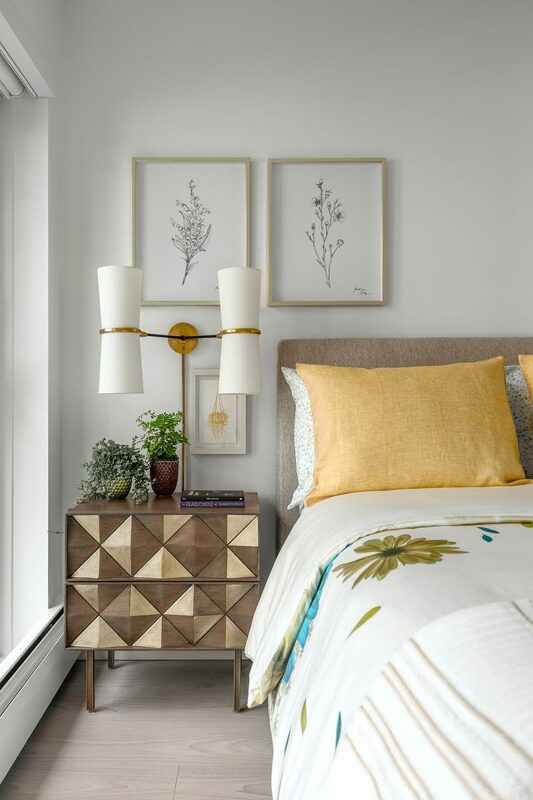 A diamond-patterned nightstand in the guest bedroom echoes the geometric designs of the TV room. The bathrooms also received special care. The master ensuite is small but creatively detailed, with the vanity area lined in marble-look quartz in an echo of the treatment in the kitchen. 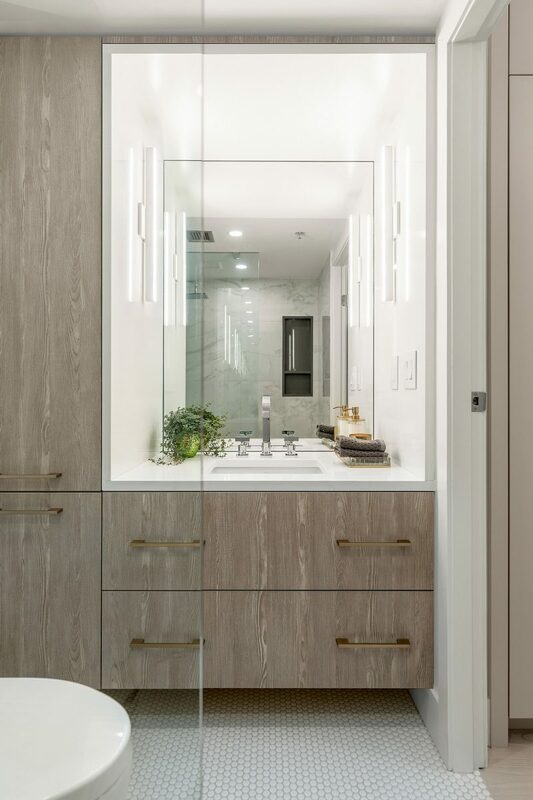 The main bathroom is also arresting, featuring a lighted stone niche apparently floating along the entire length of one wall, passing effortlessly through the glass partition wall of the shower. Reihani has great praise for her tile setter, from Equator Tiles, who not only took care of tiling but also figured out how to deliver that perfect floating niche effect. 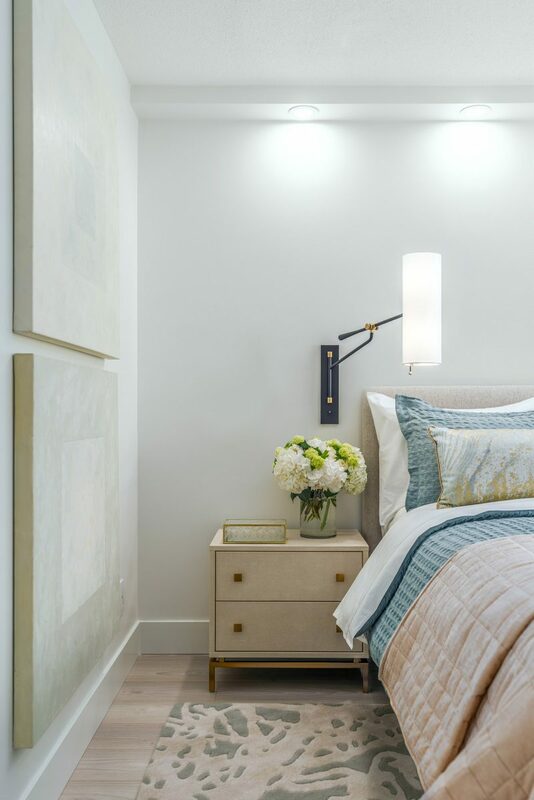 There are many clever details in the decor that are subtle and attractive but functional – for instance, shallow light boxes around the perimeter of the living room ceiling (preventing drilling into the concrete ceiling).